As close to leather as you can get - a saddle bag without harming animals. Two separate zippered pockets for skates. 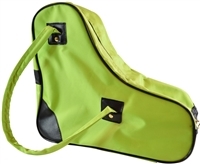 Features two extra side pockets for accessories.Will comfortably accomodate virtually any size roller skate. - Black with blue, brown, pink, red, or black trim.